Eva Volitzer graduated from The National Academy of Theatrical and Film Art “Krustyo Sarafov”with MA degree in acting. She is an eminent Bulgarian actress, who has performed over 50 roles on the stage of various Bulgarian theatres such as Russe Drama Theatre, Sofia Itinerant Theatre, Theatre “Tears and Laughter”, etc. She has recreated heroines in classical plays by Chekhov, Shakespeare, Ostrovski, etc. as well as in contemporary plays by American and European dramatists. This theatrical season she has acted very successfully in “My Old Lady”, a play by the American dramatist Horovitz at the Theatre of Satire in Sofia. Performances in which she acted were presented in Tel Aviv, Vienna, Riga, etc. She is a lecturer and an Associate Professor of acting in New Bulgarian University, Sofia. She has been the producer of dozens of performances of students. Some of them were presented in Switzerland, France, Austria, etc. She has also been an art director of youth dramatical studios formed within the Theatre “Tears and Laughter” and “St. St. Cyril and Methodius” Foundation. Eva Volitzer was a Fulbright scholar in New York, USA, in 2002-2003. She taught acting in Pace University. In 1996 a compact disk of hers came out with 22 ancient Jewish songs in Ladino. The disk was published by the English Musical Company ARS MUSIK and now has spread throughout the world. The disk is also available in the Library of Congress in Washington. 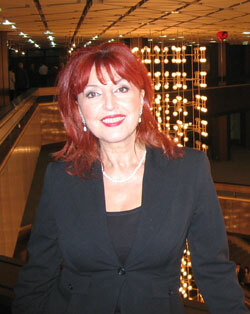 Eva Volitzer is the founder and director of the Independent Theatre “Gallery”. She has received numerous national awards. There have been a great number of interviews and reviews about her in the press.